Blogger launched in March five blog views that used cutting-edge technologies to transform a blog into a Web app. Back then, visitors had to enter a special URL like gmailblog.blogspot.com/view/sidebar or install a Chrome extension to switch to one of the new interfaces. Six months later, Blogger created two new views (classic and magazine) and added the list of dynamic views to Blogger's template editing section so that blog authors can replace their template with one of the seven views that are now available. There are three kinds of dynamic views: photo-oriented templates (flipcard, mosaic, snapshot), text-oriented templates (classic, sidebar) and magazine-like templates (magazine, timeslide). If you don't have a photoblog, classic, sidebar and magazine are the best dynamic views for your blog. Blogger's new templates bring a lot cool features and change the way readers interact with a blog. Infinite scrolling replaces pagination, blog posts are loaded using AJAX, Blogger caches blog posts so they load faster, images are downloaded as you browse, you can use keyboard shortcuts (j/k or n/p) to go to the next or previous post just like in Google Reader. There's also instant search that shows the list of results as you type. 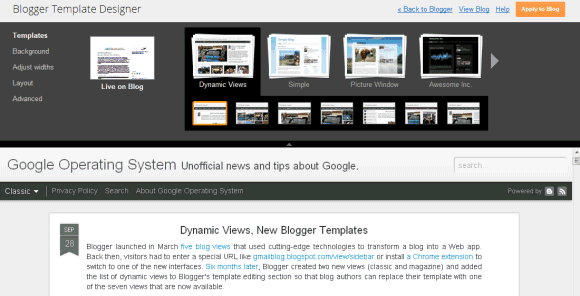 I don't intend to switch to one of the dynamic views, but my favorite templates are sidebar and magazine. You can always bookmark these links or use Google's Chrome extension, which needs to be updated to add support for the two new dynamic views. 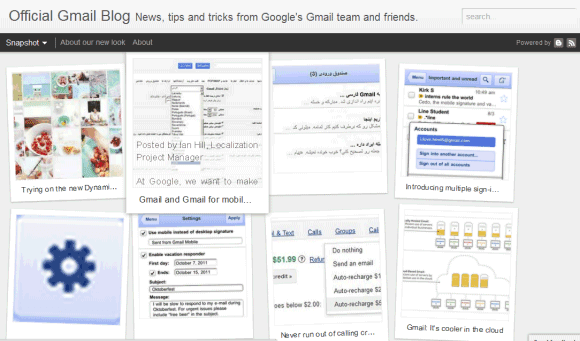 Some Google blogs have already switched to the new templates: Blogger Buzz, Gmail Blog, Google Docs Blog and LatLong. No Disqus or gadget support is kind of lame, but otherwise I really like them. Exactly I want to have a sidebar for twitter etc, hopefully they add that. How did you apply the Dynamic Viewing? I read the instructions and still can't figure it out...help? Thank you! Tangential question: Can Blogger and Google Docs be used in conjunction to host podcasts? Blogger itself does not support hosting audio files, but we could upload it to Google Docs and link from blog posts? I found the lack of customisability a huge downfall too - no Disqus commenting system and no widgets means no switch. I have a somewhat popular blog and I love this!! I've converted it to Dynamic to see how my visitors react. Like anything else that's new it will take some to make it perfect. The best way is to have us blogger users actually put it to use and as always Google will take our feedback and tweak the system. Hey I too have a blog and I was wondering if there was any way possible to keep some of the old gadgets like the poll and the counter...because I really liked allowing my audience to interact a bit with the page. Also, I was wondering if there was any way to change things up so that there is a black background and maybe the font is something a little different. Thanks! The "Read More" feature no longer works, too. Do you know if they will ever add support for gadgets and perhaps an option to change the default font? I just wanna say thanks for the writer.This is great article.I have found your blog to be quite useful. Keep updating your blog with valuable information.Please update all information.Thank u. It's not possible read posts on mobile phones. Why? Really beautiful templates, but you have to enable the Layout option or this templates are useless !!! Is there a way to have a dynamic view be the default mobile or tablet view? Wordpress has this functionality. what about the ADs ?? i removed them from the blog but it still appear on the dynamic templates !!! I would like to see more gadget support.I like this template and how it looks, however will not be using it until support for things like followers is fixed. What's the point? Even the read more function doesn't works! Though I've posted a hyperlink that directs users to dynamic view sidebar coz the background of my blog is dark. I think it would enable readers to experiment with different themes but I am keeping my customized/self-designed theme and dynamic view as alternate theme :-) Cheers! The lack of gadgets is very dumb. My analytics quit working. I can't upload a header like promised. My favicon is gone. You name it, it's not there. I'm trying it now on one of my blogs and even though it looks pretty and polished, I'm not sure how long I'll keep it. On another note, my page views have already increased. We'll see. I can not see the links at the top that let you sign in and go to the dashboard ect...... please help.. I don't like how it looks my pages links blink crazily and won't let you even click on the link to my static pages... These designs look cool... but in the end they are really sucking for me!!!!!!!!!!!!!! Have changed to dynamic views.There is still some work that needs to be done here. The 'Next Blog' ,Widgets, archives are all gone. Have a newly created blog so not much impacted but guess blogs that have been in existence for some time might lose out on some data.Overall looks cool.Good work and lets have the updates soon. how to post ? I cannot find it! Google webmaster tool now display my blog have duplicate title tags in my blog dynamic view templates so how do i fix this issue? 2. 400 eror (bad request) ..
i like it so do my friends...only one problem, they can't follow my blog! I love it! I just want to change the color and the font and it'll be perfect! I would like to appreciate you the way you have shared the post with us. It is really hard to find the quality post, but you have done this job nicely man. I tried but i return back on previous tamplate. Sure google will solve it, because D. view is really s step forward! I got 2 questions. I use the sidebar dynamic view and for whatever reason there is no way for the date to show up! I hate having all these posts and not seeing the dates on them. Can anyone help me with that? Also, I really want a tracker for each one of my articles so I know just how many people are watching each page. Nothing too complicated. In case you were wondering, it's kingmarek.blogspot.com...please let me know if you can help! I must express appreciation to the writer for bailing me out of such a difficulty. After scouting throughout the World Wide Web and coming across basics which were not pleasant, I assumed my entire life was done. Living without the strategies to the difficulties you have solved all through your good guide is a crucial case, and the ones which might have negatively damaged my entire career if I had not discovered your web site. That capability and kindness in playing with every item was crucial. I am not sure what I would've done if I hadn't encountered such a thing like this. I can also now look forward to my future. Thanks a lot so much for the expert and results-oriented guide. I won't hesitate to refer your blog post to any individual who should have care about this area. This template is so cool but it would become much more wonderful if bloggers can add widgets. Most important one probably is the counter clock. No visitors want to surf webs alone, right? I'm enjoying the look of the new dynamic template, but still don't know how I go from my website to the blogger dashboard, or how to add my #1 widget -> Followers. 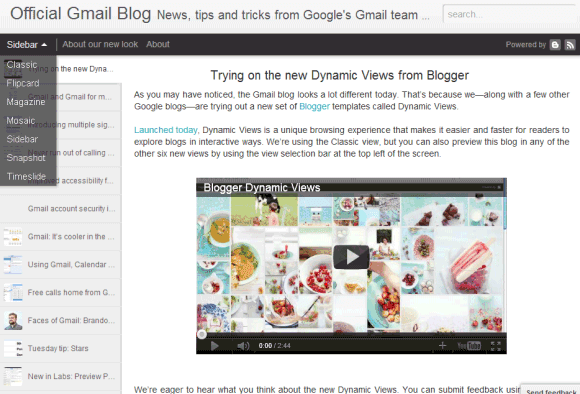 It get a message that says Dynamic view isn't available for my blog. Why is that? Everything has advantages and disadvantages. Similarly, the dynamic view this template. we just choose to use or not use it. @Zaftig Diva: go setting-other-allow blog feed change to full. I'm using the dynamic template coz it's a cool news, but I'm waiting for many improvements of that. I agree with all your comments. Strips all character from your site and makes the presentation more about what the reader finds pleasing as opposed to presenting the reader with your own unique character. Thumbs down. It would be good if were allowed to just use these as templates with lots of customisation options, and without readers being given the option to change my look. Dynamic template is no longer available. Will it available soon? How to disable this dynamic views, as the feature to disable dynamic views through "settings" no longer appears? I have to disable it cuz it causes duplicate title tags in webmaster tools. help me! WHY CANT I USE HTML??? My god, somehow I managed to get google analytics working. Yipeeeee! Have to say that I really like the dynamic view and it has added a fresh new look to all my old posts. The hit rate on the old posts is now way surpassing the daily rate on the new post. This is good news for my site. Added dynamic views to my site www.latedealcottages.com and I like the results. Unfortunately you cannot amend the meta data, which seems a bit odd considering it is google. Anyone found a way around this yet? My dynamic views template used to show an icon of the videos, but recently each new flipcard only shows text no matter what - even if the only content of the post is an embedded video...What's up with that? Is it possible to put a follow button for twitter in the site bar with these dynamic view themes? I like the dynamic view themes very much and hope there will be more features/ gadgets for it. I read your post and followed the instructions. I was still unable to apply Dynamic Viewing. Could you brief me a little more on this? this template consume too much of bandwidth, the more u scroll, the more it appears older posts, any setting you know to limited the post per page? how i can set only single image from multiple images per post in snapshot views?set single image per post in home page...????????? I am using Dynamic view sidebar. It is very cool template and easy to navigate. how to sign in to a dynamic template or see my stats??? Massive increase in hits with Dynamic Views was of two kinds: people searching Google Images found images I use but did not click or were not interested in text; and GoogleBots seeming to be tremendously interested and acting like humans, but apparently not. I decided to content myself people who actually want to read my blog, tiny though the number may be. Nice post thanks for sharing...!!! great Nice post with informative blog , thanks for sharing..!! !